Red carpet magic. | Image courtesy Flickr user WEBN-TV. Here are a few game ideas to spice up Oscar Night. Don’t get me wrong – I love watching the Oscars each year, but I’ve got to admit, sometimes I get a little bored. I mean, I love all the glitz and glamour, but it just seems to go on forever. In fact, last year, I fell asleep and missed Viola Davis’ acceptance speech for best supporting actress. Of course, I YouTubed it later, but I was a little crushed and annoyed with myself for missing it live. Needless to say, I won’t be falling asleep during the Academy Awards this year. 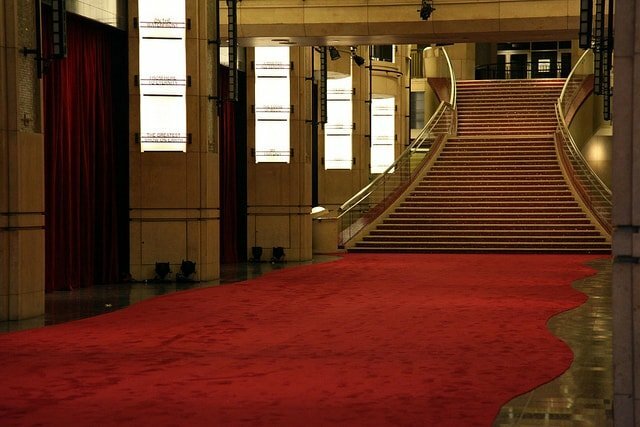 In fact, I’ve invited a bunch of my friends over for a glamorous red carpet party. I figure that between the six of them, they should be able to keep me awake. 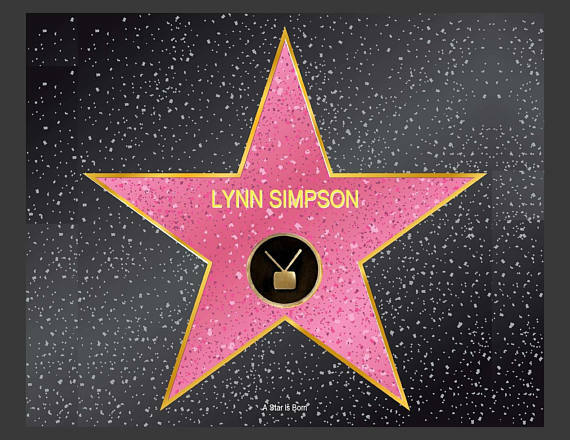 To keep everyone extra engaged and alert for the whole show, I’m planning a few fun games that we can play to fend off any boredom and make us feel like we are part of all the Hollywood excitement. 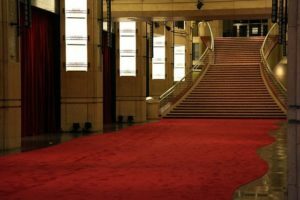 So, if you’re planning on throwing an Oscar party this year, listen up because I’m going to share my favorite Oscar-inspired red carpet party games for adults to ensure an extra captivating and interactive evening. 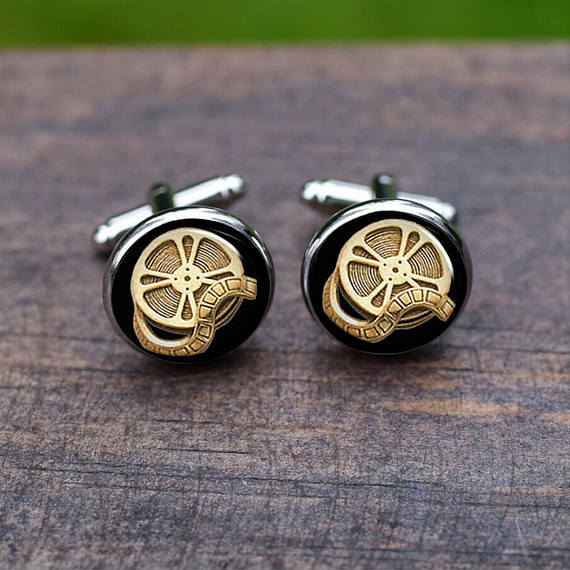 Filmstrip cufflinks. | Image courtesy Etsy seller GiftsVenue. Everyone gets a chance in the spotlight with this fun game. Before the show starts, hand out some paper and have everyone write an acceptance speech for the award of their choice. Alternatively, you could have your guests do this before they arrive at the party. In either case, when it comes to the speech, there are no rules! Your guests can make it as funny, sad, powerful, or obscure as they want. Feel free to add more categories if you’d like. In fact, aim to have the same number of categories as you have guests so everyone has a chance at winning. Don’t forget to present awards at the end using your best Oscar host voice. 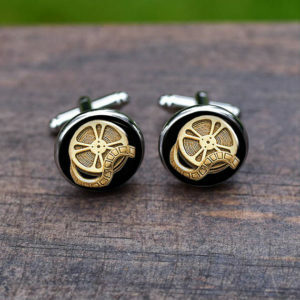 I like to give out movie-themed gifts like celebrity-themed stickers or movie reel cufflinks. Cast your vote! | Image courtesy Etsy seller ProPartyPlanner. Once you’ve settled on your categories, hand everyone a sheet of paper and write them all down. While you enjoy the show, privately jot down your answers for each of the categories. At the end, collect everyone’s ballots and tally up the results. You’ll all have a good laugh (and probably a good debate) about the winners. An edible Oscar. | Image courtesy Etsy seller DeliciousCandyCo. 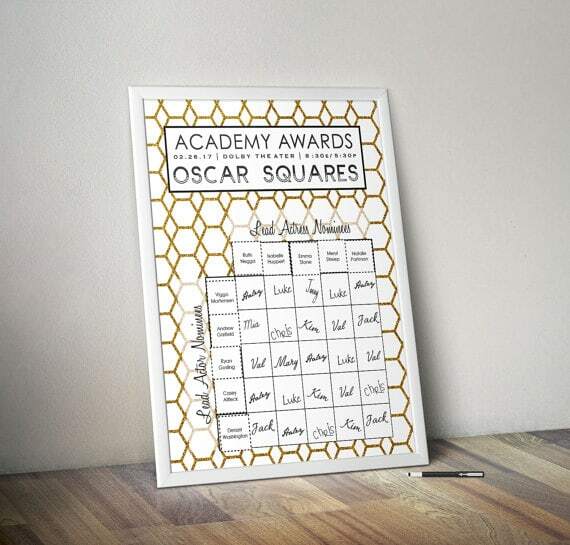 Before the evening begins, write down the names of some of the films nominated for best picture, the actors and actresses nominated for supporting and leading roles, and prominent movie characters on separate squares of paper. Put them all in a classy black top hat and when it’s time to play, take turns giving your most convincing performance. You can either play in pairs or just have the whole group guess. 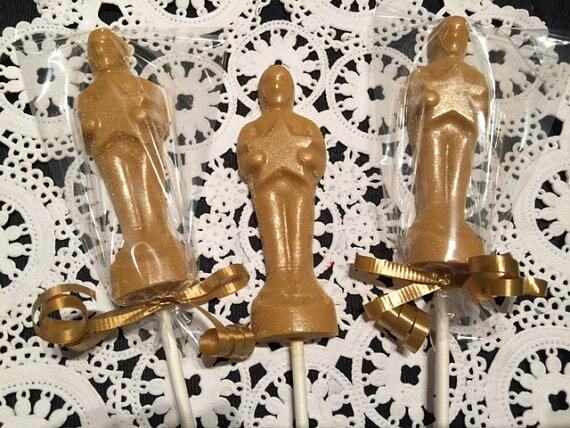 At the end of the game, have everyone vote for the best actor/actress and present them with a pretend Oscar! I’m personally a fan of handing out chocolate Oscars (and really don’t understand why the real ones aren’t also made of candy considering how long those celebs have to sit through the show without a snack). You’re a star! | Image courtesy Etsy seller rostudios. I’m someone who looks for any opportunity to have a gift exchange, so you better believe that my friends and I are doing one at this year’s Oscar party! However, with a lot of other Oscar party planning ideas to bring to life, I’m going to use an online Secret Santa generator to organize who gets paired up together and all the other little details so I can focus on other things. You’ll have so much fun swapping gifts and feeling like a star for the evening. You can even play some fun gift exchange games like White Elephant if everyone really needs perking up! I’m so excited for this party that I’m honestly counting down the days until the Oscars. And if the glitz and glamour aren’t enough to keep me awake, these games most definitely will. Looking for more fun party game ideas or wanting to start your own gifting game? Elfster is here to help make this Oscar party the best one yet. You can also connect with Elfster on Facebook, Twitter @Elfster, or Instagram @Elfster.